Normally on this website we discuss ways to save money and reduce the cost of home ownership. 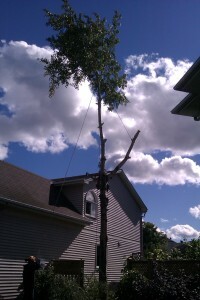 However this post and the next two will talk about tree removal and why it sometimes is worth it to hire professionals to remove trees. Reliable tree service removal for trees on your property is sometimes difficult to find, however we recently had a tree removed on our urban property and the team of four guys did a really fantastic job. They showed up on time, were courteous and very careful of our plants and shrubs. They took extra care to make sure that no damage was done to my shrubs, my house and my fence. I watched them do the work the entire time, not because I was concerned about their work. I was really interested in the process of taking down a tree that was at least forty feet in height in relatively tight conditions. There were two houses close to each other and the tree was within 10 feet of my house. They have obvious done this many times. They were organized, they took all of the safety precautions that were needed for themselves and my property. The job was completed within an hour. Everything was cleaned up and the leaves and small twigs etc that fell were raked and blown into a pile to be removed by them. There was a bit of sawdust left over, but that will disappear over time as nature takes over. Overall we are very satisfied and I would recommend these guys any time. We do not normally link to other web sites from this site. However we are so impressed with the service that we have added a link. 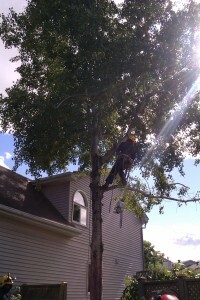 If you are in the Ottawa , Ontario area and need a tree removed, click here for Ottawa Tree Surgeons. Normally I would do this kind of work myself. I have cut many trees down in my life and have my own chain saw. However there are a couple of reasons I decided not to tackle this particular tree on my own and depend on the reliable tree service of this Ottawa based company. First this tree was a bit too close to my house and my neighbor’s home. This tree might have fallen perfectly into our front yard, however a slight wind blowing a top heavy tree at the wrong time could have blown it slightly off course as it fell and it could do a lot of damage to either home. Secondly we have a lot of shrubs etc and I really did not want to damage these shrubs. It would mean digging them out and / or hoping they would recover next spring. Plus my wife would not be too happy! Thirdly, it is all about the cleanup. This team came with a wood chipper. The tree and all of the limbs and leaves was chipped into wood chips in no time at all. It took just over one hour to cut the tree down and do the clean up and they were all done. This same job would take me at least a day and I would still need to dispose of the tree! From booking the appointment, to confirming the night before when they would arrive, to arriving on time, to not damaging our plants etc, to cleaning up, this team of four guys did a really fantastic job. In our next post, I will write more about the process of how they take down a tree of this size. But I do want to refer you to the picture on the left. It shows our tree just before they take the top off the tree. In this picture, the fellow up in the tree is just taking the last major branch off halfway up the tree. You can see the ropes attached to the limb as he begins to saw the limb off at its base close to the trunk of the tree. Next is the top of the tree to be sawed and lowered. In our next post we will show some of the pictures associated with this activity. If you need a tree removed, then these are the guys to go to. We have not used any of their other services. However based on this work I am sure they would do an excellent job. Can’t say enough positive things about their work! I saw this tree come down and I was really impressed by the skill and safety of this tree removal company. They really did a good job and cleaned everything up after. that was a pretty big tree that they took down. and it only took an hour, that is pretty amazing. We have a few trees that we want to get removed as well. thanks for this post, now we know what to do.